Diana Rudolph was born in Aurora, Illinois in 1972. Although she grew up in the western suburbs of Chicago, she spent a great deal of time with her family in the Florida Keys, where she began fishing at the age of five. Diana won the Hawley Invitational Tarpon Tournament, a male-dominated event and she holds two I.G.F.A. fly division records. 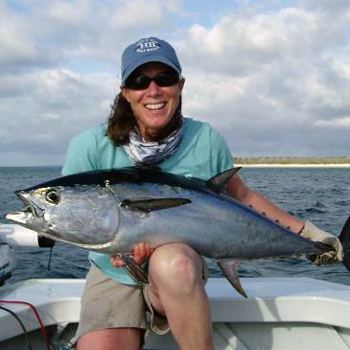 Most of her fishing was done on the patch reefs and flats of Islamorada with conventional tackle; however, when she was 16, her father introduced her to fly fishing and her love for the sport grew. After receiving her B.A. in Biology and attending graduate school, she returned to her passion. She has since fished several flats and offshore tournaments in Islamorada and recently won the Hawley Invitational Tarpon Tournament, a male-dominated event. In addition, she holds two I.G.F.A. fly division records. Diana is currently employed at Sandy Moret's Florida Keys Outfitters, for more information visit their website at www.floridakeysoutfitters.com.